Memorizing vocabulary words and their definitions can be tough. Some words seem very strange the first time you see them. Substitute words, visualization, and association are the secrets to making it easy, as explained on the Keyword Method page. In fact, if you make the effort, you can memorize lots of terms and their definitions in a short time. Not only is improving your vocabulary a great way to advance your career (it can make you seem smarter), but it is essential if you plan to take college or graduate school entrance exams like the SAT and GRE. And nothing is more embarrassing when someone uses a word in conversation that you don't understand. Below are examples that show how to memorize vocabulary words using substitute words and association. Keep in mind, the clearer the image, the better your recall. Example 1 - Aglet. An "aglet" is the plastic piece at the end of a shoestring. The aglet keeps the shoelace from becoming unraveled. It also helps you thread the shoestring through holes when lacing up the shoe. So what's an easy way to remember this strange word? Create a memorable, crazy mental image that reminds you of the sound of the word. 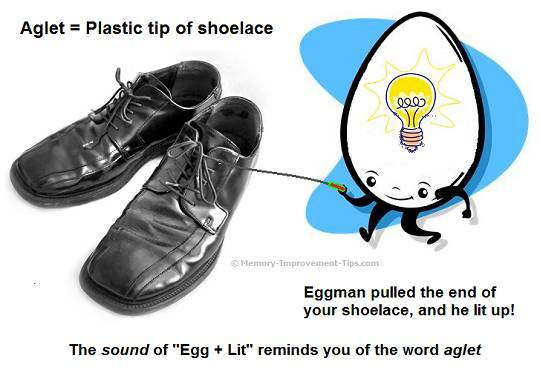 The eggman is pulling on the end of your shoelace. As he does this, he lights up. This picture is strange and impossible, of course. That is what makes it stick in your memory! Aglet isn't the most useful word to know (unless you're in the shoe business). But I picked it as an example to show that the definition of any word can be remembered by thinking of a bizarre scene that links the meaning of the word to the sound of the syllables in that word. Example 2 - Exorbitant. This word means "exceeding the bounds of reason; excessive". For example, paying $10 for a gallon of gas would seem to most people an exorbitant price. To remember the definition for this word, first break it down into smaller substitute words using the *sound* of the word. Then associate these words with the meaning of exorbitant. One way is breaking the word down into "ex" + "orbit" + "ant". Now, "ex" is a commonly used prefix that simply means "out" (for example, someone's ex-husband is their husband who is out! ); "orbit" could refer to a spaceship in orbit around the Earth; and an "ant" is simply that little insect out in the yard that bites you if you mess with him. So form this mental picture: a big astronaut ant is in orbit around the Earth in his spaceship, but he's out cold (asleep). Since he's asleep and not driving, his spaceship drifts away from Earth and excessively far away, into the Sun (ouch!). Try to picture this image vividly. 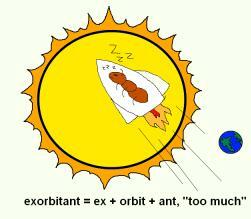 Now, when you hear the word "exorbitant" (ex-orbit-ant), you'll think of your image of the ant floating from Earth orbit to excessively far (too far) away. Example 3 - Transient. When used as an adjective, transient describes something that exists for a short period of time then is gone. 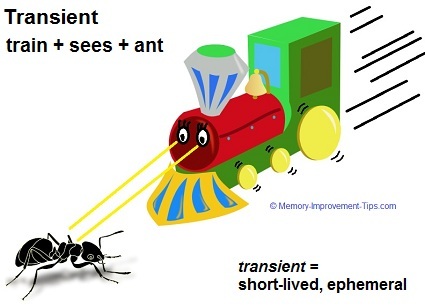 Transient is pronounced "tran see ent". I have seen this word on SAT and GRE study lists. Joe experienced transient relief when the plate he dropped didn't break on impact. On closer inspection, however, he realized the edge of the plate had chipped." A brief definition of transient is "short-lived, ephemeral". To create a strong mental link for this definition, we can encode the sounds of word "transient" and its meaning as mental images. We do this by thinking of images to represent the phonetic sounds of the word and definition. Reminder: The sounds we use only need to come close. They are reminders. At recall time, your true memory will know what the real word is when you hear the sounds. Study this image. A train engine zooms quickly toward an ant crossing the train's path. The train (having eyes) sees the ant but cannot stop. The ant may not realize it, but he's about to get squashed. Thus, from the train's perspective, the ant is short-lived, a transient obstacle. It will be gone momentarily, and the train will rush ahead on its way. 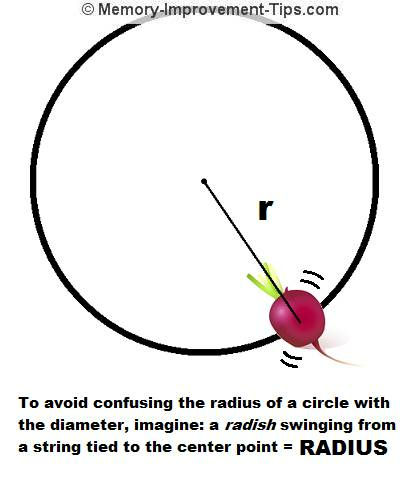 Recall works like this: You hear the word transient or see it written. You think, "What do the phonetic sounds in this word remind me of?" Seeing the image in your mind's eye, you realize the train is about to run over the ant; the train sees this is about to happen but cannot stop. The ant is therefore short-lived; his existence is ephemeral. Now you know without an ounce of doubt or possibility of confusion that "transient" means something temporary or short lived. How much more fun than rote memorization! Because the human brain was built to remember images better than abstract information, you will remember this definition more easily and for much longer than if you tried to remember it by repeating the definition to yourself a million times. Example 4 - Lobbyist. This word describes someone who tries to persuade legislators to vote for bills the lobbyist favors. Let's try breaking the sound of this word down: "lob" + "bee" + "ist". You could remember the definition of lobbyist by imagining a man or woman in a suit lobbing (throwing) a big, angry bee East (ist) through the air and into a ballot box held in the arms of the President. The bee has a duck bill instead of a nose. Try to visualize this as clearly and in as much detail as you can. As before, the sound of the word reminds you of a mental picture you created in advance that gives away the definition of the word. Example 6 - Fission. This word has a couple of definitions, but for example purposes we'll consider just one. The word fission means a nuclear reaction where a big atom is broken down into smaller parts with a release of energy. Fission sounds a lot like "fishing". So imagine a man named Adam (Atom) quietly fishing in a lake, but a "new cold ear" (nuclear) falls out of the sky and smashes his boat into a million pieces, causes a big mushroom cloud (release of energy). Imagine that one, if you will! When someone says "fission" (or you read the word), you'll think of Adam (atom) fishing and his boat being hit by a New Cold Ear (nuclear) reaction and causing a release of energy. These examples of memorizing vocabulary have in common the requirement that you need to really focus on the image you are imagining and see it vividly. In addition, it is very helpful if you review the mental image periodically, perhaps once a day for several days. A good way to review vocabulary is by making and using flashcards. Obtain a stack of 3"X5" cards. On the front, write the vocabulary word. On the back, write the dictionary definition, plus a short description of your Keyword Method image. After you've made a bunch of these cards, flip through them one by one with the vocabulary words facing up. You should be able to quickly picture the image you associated with each and remember the definition. With some practice, memorizing vocabulary of any kind will be a snap!